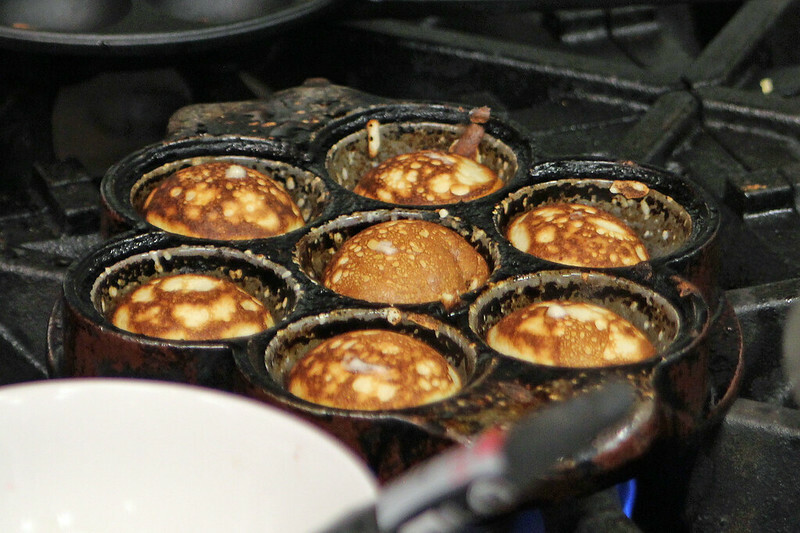 Every year on Shrove Tuesday, aka Pancake Tuesday, comes one of our favourite community traditions: gathering at the hall and devouring traditional Danish ebelskiver pancakes. Ebelskivers (or Æbleskivers, pronounced ebble-skeevers) are spherical pancakes of glory that are made in a special ebelskiver pan and they are served with a brown sugar whipping cream sauce that is devine! Our village was founded by Danes (we are Danish Schultzes, not German!) and it’s nice to see traditions being carried through the generations. We love these little pancakes so much, I didn’t want to just have them once a year, so I bought two pans last year for $15 each and I’ve been making them at home ever since. This year I decided to take photos in town because these pancakes require a lot of attention with no leeway for picture-taking at home. Separate your eggs and beat the yolks with the sugar. Add the milk, salt, baking powder and flour. Last, add the cardamom. (Don’t tell cardamom I said this…but if you don’t have any it’s really expensive and I don’t find it adds or takes away anything from this recipe, shhhh!). Whip the egg whites until stiff peaks form. A great kitchen hack for this is to do this in a cold metal bowl because it gets to peak-form much faster than in a plastic bowl at room temperature. Trust me—try it! Fold in the egg whites to your other mixture and your pancake batter is ready! To make the brown sugar sauce you need to whip 2 cups of whipping cream until very stiff and then fold in 1/3 cup of Roger’s syrup (or other golden syrup if not available to you) and 1/3 cup brown sugar. It’s best to let this get nice and cold in the fridge, but still tastes amazing freshly made. Now we’re ready for the making of the pancakes. Heat up ebelskiver pans over medium to medium-high heat, depending on your range. They need to be hot before you start cooking. 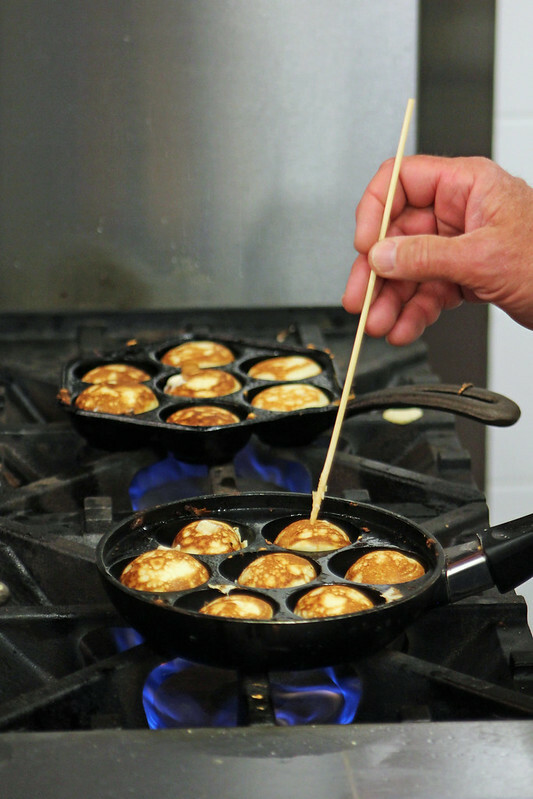 Using a silicone basting brush, coat each hole in the ebelskiver pan generously with canola oil. The oil should sizzle but not go crazy and psycho–if it does, turn down the heat a bit because your pancakes will burn. Pour batter until the holes are 3/4 full, depending on how fluffy you want them. This is where some trial and error takes place. Usually on my range at home my first few batches of pancakes cook very slowly and are a nice golden colour and cooked all the way through. The more I do the hotter the pan can get and I’m borderline burning the outside and the inside is still doughy. I just use chopsticks or wooden skewers to flip over the pancakes, you can even use a fork but it is a bit more cumbersome. They don’t have too cook too long before you flip them, you can give one a test around 30 seconds depending on how hot your pan is. I use my chopstick and put it in the batter that’s cooking (the first one you pour in) and see if it’s “flipable”, then flip it all the way (or most of the way) over. Take a look at this video to for a visual how-to if I’m not explaining myself very well, though he flips them very slowly so they’re hollow in the middle, we like ours filled so they get turned all the way over first go. Oh you guys these are sooooooooo good! We like them with the brown sugar sauce, but they also go great with maple syrup, fruit syrups and jams. You can also fill these with apples or fruits and cook them, but we like them plain like this. Heat up ebelskiver pans over medium to medium-high heat, depending on your range. They need to be hot before you start cooking. Separate your eggs and beat the yolks with the sugar. Add the milk, salt, baking powder and flour. Last, add the cardamom. *Whip the egg whites until stiff peaks form. Fold in the egg whites to your other mixture and your pancake batter is ready! Now is a good time to make the brown sugar sauce, or get someone else to do it while you keep making the pancakes. Whip 2 cups of whipping cream until very stiff and then fold in ⅓ cup of Roger's syrup and ⅓ cup brown sugar. It's best to let this get nice and cold in the fridge, but still tastes amazing freshly made. Using a silicone basting/pastry brush, coat each hole in the ebelskiver pan generously with canola oil. The oil should sizzle but not go crazy and psycho--if it does, turn down the heat a bit because your pancakes will burn. Pour batter until the holes are ¾ full, depending on how fluffy you want them. This is where some trial and error takes place---you want the outsides golden and crispy, but the insides cooked and not doughy. Flip the pancakes fully over, or as far as you can turn them to took on the other side. I just use chopsticks or wooden skewers to flip over the pancakes. They don't have too cook too long before you flip them, you can give one a test around 30 seconds depending on how hot your pan is. I use my chopstick and put it in the batter that's cooking (the first one you pour in) and see if it's "flipable", then flip it all the way (or most of the way) over. This recipe makes approximately 56 pancakes. Serve with brown sugar sauce and enjoy! *A great kitchen hack for this is to whip the egg whites in a cold metal bowl because they get to peak-form much faster than in a plastic bowl at room temperature. Trust me---try it! 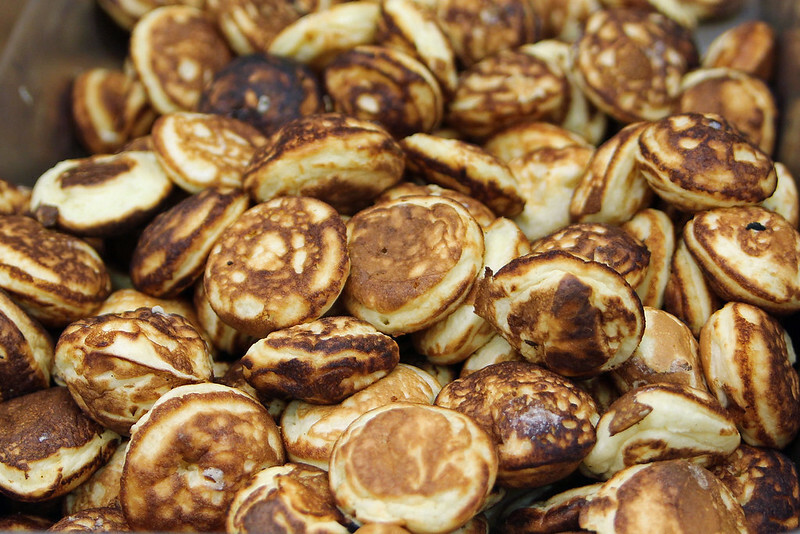 We estimate that there’s about 5000 of those little pancakes made for our Shrove Tuesday supper! Each recipe makes approximately 56 pancakes. OMG, I love those! They have made it into the southern parts of southern Norway as well, and I tasted them for the first time just a few years ago. Heaven!